The Greensboro Shrine Club is the local arm of the Shriners International fraternity of approximately 300,000 members throughout the United States, Mexico, Canada, and the Republic of Panama. The Shrine Organization Is best known for its colorful parades, its distinctive red fez, and Its official national philanthropy – The Shriners Hospital for Children – “The Heart & Soul of The Shrine”. In 1922 the Shriners founded the first Shriners Hospitals for Children in Shreveport, Louisiana. Since then this unique philanthropy has grown to an extraordinary health system with 22 facilities in the United States, Canada and Mexico. The Greensboro Shrine Club was founded approximately 1915 in Greensboro where they met upstairs at the old King Cotton Hotel at the corner of Davie and Market Street. Here is where they organized the Club and started holding their meetings. Approximately in 1916 behind the old Mayfare Cafeteria at the corner of Friendly Avenue and David Street (currently a Parking Garage) Greensboro Shrine Club started meeting there, plus the Oriental Band started practicing here at the newly formed club. Approximately in 1951 the Club purchased the land at 5010 High Point Road to build a new club. The Club opened its doors around 1954 which the Club renamed itself “Oriental Shrine Club”. The Club served Greensboro and High Point Shriners for a few years. Approximately in 1958 the High Point Shriners founded their own Club in High Point. Oriental Shrine Club retained this name until 2013 when the Club renamed itself back to “Greensboro Shrine Club” due to the location of the Club. 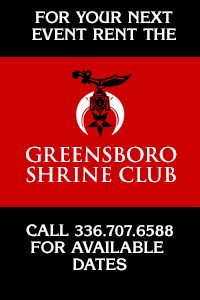 Greensboro Shrine Club is one of the oldest Clubs under the Oasis Shrine Temple of Charlotte, NC. To this date Greensboro Shrine Club has had 11 Past Potentates of the Oasis Shrine Temple and of the 11, four are still active in the Club.